Badger (left) and Robyn (right)! 3/3/19 – This gorgeous duo is now rehome! This devoted and heart-meltingly adorable pair of sweeties have been promised by Adopt a Dog North East that they will find them a home where they can remain together. They are the very best of friends! Little Robyn is the red and white papillon to the right. She is 9 years old and she just wants to spend a quiet retirement with Badger at her side. She doesn’t need a lot of exercise, but she does require lots of love, as well as security and human companionship. She is particularly loving towards female humans. Robyn has one front leg that is shorter than the rest but this doesn’t bother her and she doesn’t need any medical attention for it. She can manage short walks, but is used to just pottering about in the garden and is happy to continue doing that. Robyn’s best friend Badger is an 11 year old terrier cross with the most alluring of ears. He is also looking for the quiet life. He is a calm, easy-going gentleman who prefers to keep to his bed most of the time and snooze his days away. He is very loving and also shares an interest in spending time sniffing about the back garden with Robyn. This sweet pair’s mum just passed away, so they are looking for a new loving human to mend their broken hearts and give them the quiet, loving home they deserve in their later years. 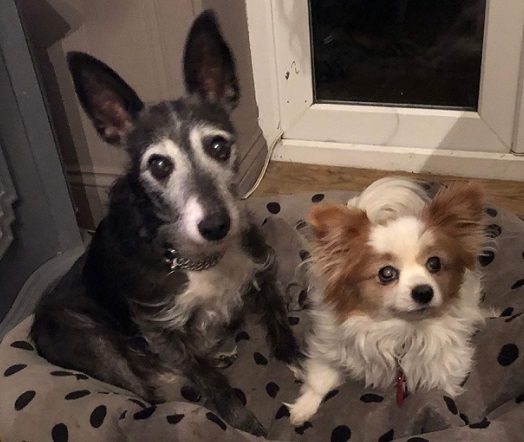 Badger and Robyn are easy-going enough to live with children, other dogs and cats, but they would probably do best as the only dogs in the home, or with quieter calm dogs and older children, given their age. Please mention that you saw Bouncer on the Oldies Club website.